Most all of you out there have probably seen a post or two on Facebook about a new, remote Tarpon fishery in the jungles of Costa Rica. When I saw the first video of 150 pound Tarpon rolling, feeding, and being caught in a river that was 50 feet wide, I was immediately intrigued. Right away I put the word out to Fly Water, and the outfitter for Jungle Tarpon, that I needed to see it. I was able to meet up with Brian Gies, one of the owners of Fly Water Travel, in San Jose after he had spent a few very successful days in southern Costa Rica at Tarponville Lodge. We had a beer and dinner with our friend Crister, who had just spent a week fishing and filming where we were about to go. The reports were though the roof, with him graphically telling us stories of huge Tarpon inhaling their flies, and almost jumping in to the overhanging jungle canopy when they felt the sting of the hook. Sometimes things just don't align, and they did not for us. Heavy rains pounded the mountains where our river originated, and turned the river to mud. The Tarpon were there.....we saw them roll. Some were absolute knee knocking monsters. Unfortunately, they just couldn't see the flies we were throwing due to the water conditions. Easy to see why the fish couldn't find our flies in this water. There was a huge Tarpon rolling occasionally in this pool. That said, I can't wait to return! This is an adventurous trip, in a remote part of the world, with jaw-dropping potential for world class Tarpon action. It is not for everyone though. Anglers expecting plush accommodations, a chocolate on their pillow at night, and gourmet meals need not apply. Those looking for adventure, a look at life in rural Costa Rica, and chances at world class Tarpon will find Jungle Tarpon a gem. Here are some of the details. Anglers arrive in San Jose, and are transported overland to this region. The drive is about 5 hours, and is very interesting and beautiful. 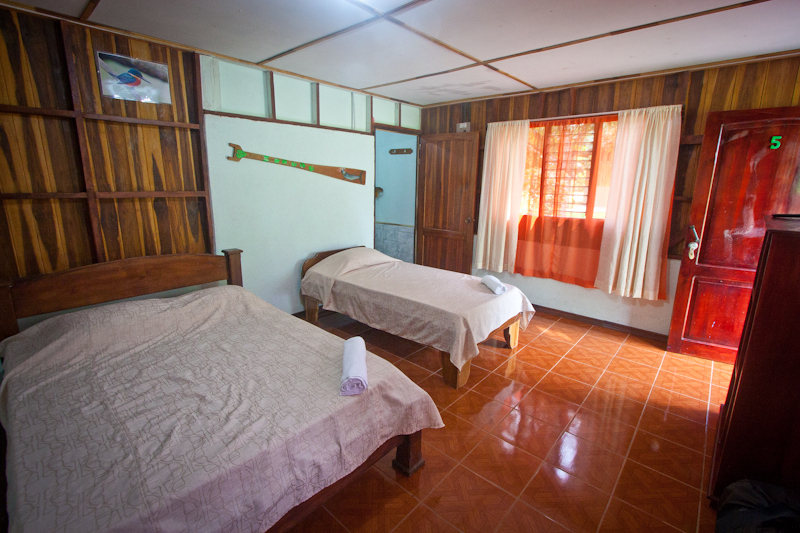 Accommodations at Jungle Tarpon are simple, but comfortable. Anglers share rooms with two beds, a bathroom, and a shower supplying plentiful cool water! Meals are most often eaten in one of the small restaurants in town. They are simple, but I thought very delicious, usually consisting of fried fish or chicken, rice, beans, and salad. Days are split, with an early morning start, lunch and a siesta at midday, and fishing again in the afternoon and evening. The fishery is divided in to two very different kinds of fishing....the moving river itself, and a vast network of shallow lagoons. Boats normally trade fishing these so that pressure is light. Maximum occupancy is 4 anglers, and the season is short.....August through December with some weeks off for full moon and resting of the river. This means that there are only about 15 weeks each season available to book. Price is $3990 per person for a 6 night, 6 day fishing package. The wildlife at Jungle Tarpon was great. Lots of monkeys, iguanas and lizards, and tropical birds. Click on the following links to see how things should look when the fishing is normal at Jungle Tarpon. Make sure to scroll down on the second link and watch the video!